Main objective of this article is to Analysis on Investment Objectives. 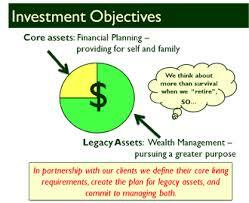 Here briefly explain Investment Objectives in financial point of view. Many people who state that their objective is income typically complain when their expenditure does not appreciate just as much as others do, especially through rising markets. However, when the objective is income, then one must go through the Rate of Return, as mentioned above. There are also those that are interested in something often known as Income with Preservation regarding Capital, which means maximizing cash flow received while preserving as much as possible the investment corpus.